Art Case Stroud Piano with Beautiful Hand Painted Chinoiserie Style Landscape paintings representing peace, tranquility, music, dancing, nature, wealth, beauty, happiness, prosperity, health and rejuvenation. Piano was manufactured in NYC in 1930’s and hand painted soon after. We just had two artists restore the paintings and our technicians refurbished the piano. The heavily carved decorative legs are Jacobean Style. The following information was provided by Asian Art Historian Doctor Ann Barott Wicks. To see her full report click on the PDF here . Here is some of what she said. 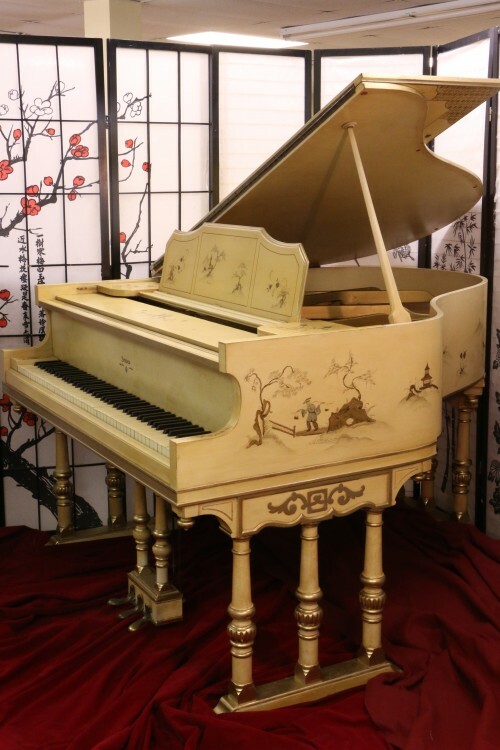 “The piano is painted with willowy Chinese figures in traditional Chinese garden settings. The motifs are similar to the fanciful chinoiserie furniture decoration that was popular in 18th-century Europe. One of the painted scenes shows a scene of music and dancing. The seated woman plays a pipa, and the young man plays a bamboo flute. The long sleeves of the dancer on the right are typical and add to the effect of the dance. The flowery clothing and hat of the youth are fanciful, as is his depiction as one of the musicians. There are several garden scenes. In theory, the Chinese garden is a microcosm of the universe, and should include four important elements—mountains, water, trees, and humans. Garden architecture, such as pavilions and bridges, represents the human element even when a human being is absent. Bizarre rocks, such as those seen in the foreground of the composition below, are used to represent mountains. These gardens were built for government officials to momentarily escape the bureaucratic life and refresh themselves as if they were in the mountains. Mountains, both sacred and magical places in China for millennia, were considered places for spiritual renewal. Fishermen are idyllic characters frequently found in Chinese landscape painting, as well as poetry. They represent the simple, carefree life in natural surroundings, romanticized by the literati. A rather curious figure is a seated woman in a voluminous white dress and somewhat elaborate headgear. She faces a boy who reaches toward her. A woman alone in a garden with her son is a familiar motif in Chinese painting. Boys symbolize wealth and continuation of the family line. While the artist is unknown, she obviously had training in Chinese painting, and was more than likely Chinese. Because of the headdress and clothing, my first thought was that the woman might represent a goddess. Floral motifs decorate the music stand and keyboard cover. The flowers are probably meant to represent the peony, symbolizing wealth and beauty, and azaleas, symbol of happiness and prosperity. PIANO comes with warranty. Nationwide Delivery. This piano is a perfect candidate for a PianoDisc IQ Playersystem installation. For further information call Sonny at 631 475-8046 or email info@sonnyspianos.com.